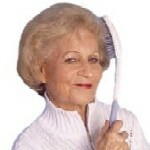 Long Handled Brush is a necessity for anyone who has suffered a stroke, has Arthritis or any other condition that makes raising their hand above their shoulder difficult or impossible. The brush feels good in your hand because of its ergonomically designed handle and the rubber like material offers a soft, comfortable, slip resistant grip, even when wet. 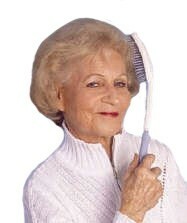 The 14 inch long brush is made of nylon bristles, each with a nylon tip for smooth and comfortable brushing. The brush section is over 4 inches long and 2 inches wide. The Long Handled Comb is a wonderful grooming essential for Stroke survivors, people with Arthritis, or people with difficulties grasping and reaching above the shoulders.